Michael Patrick Barrett (born October 22, 1976) is a former Major League catcher and current manager of the rookie-level Gulf Coast Nationals. He started his professional career with the Montreal Expos at age 18. Barrett spent three years playing in Minor League Baseball as a shortstop and catcher. He played with the Honolulu Sharks, West Palm Beach Expos, and Delmarva Shorebirds, and was elected to two Minor League All-Star games. Barrett made his Major League debut in 1998 as a third baseman, but was shortly outrighted to the minor leagues to play with the Harrisburg Senators for a season. Upon Barrett's return to the Major Leagues in 1999, he ranked among the top offensive rookies in various statistical categories. Barrett failed to stay healthy during the 2003 season, which prompted the Expos to trade him to the Oakland Athletics, who in turn, traded him to the Chicago Cubs. 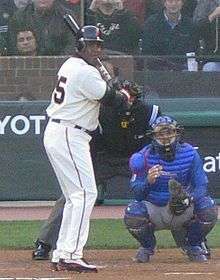 During his tenure with the Cubs, Barrett won a Silver Slugger Award in 2005, and recorded near career-high statistics in 2004 season. The Cubs traded Barrett to the San Diego Padres in June of 2007. Barrett sustained two major injuries, which caused him to miss 115 games with the Padres, and was subsequently released after the 2008 season. Barrett attempted to make a comeback with the Toronto Blue Jays in 2009, but continued to struggle with injury issues, which led to his release in the subsequent offseason. He spent the second half of the 2010 season in the New York Mets minor league system, and has not played professional baseball since, but has not officially announced his retirement. Barrett was also a volunteer assistant coach for the baseball team at the University of North Georgia. Barrett was born in Atlanta. He attended Pace Academy, where he excelled in baseball. During his senior year, Barrett won Atlanta's Gatorade's Player of the Year, and was named to the All-USA High School and First Team High School All-Americans All-star teams. He was considered to be one of the top draft prospects that year, and declared eligibility for the upcoming Major League Baseball Draft shortly after graduating from high school. The Montreal Expos selected Barrett as the 28th overall selection in the 1995 draft. He spent the next three years in the minors, playing in the Gulf Coast, South Atlantic, Hawaii Winter Baseball, and Florida State Leagues, during which he was converted from a shortstop to a catcher. His Minor League Baseball career was highlighted in 1996, when he scored 57 runs and recorded 113 hits as a member of the Delmarva Shorebirds. The Expos called Barrett to the Major Leagues on September 19, 1998, in a game against the Cincinnati Reds as a third baseman. He managed to hit a home run and a single in the game. After only playing eight games as an Expo, Barrett was sent to play for the Harrisburg Senators, a Class AA team from the Eastern League. He recorded 145 hits, and seventy-eight runs, nineteen home runs, and eighty-seven RBI en route to winning the Double-A All-Star Catcher and Montreal Expos Minor League Player of the Year awards. His performance allowed him to claim a spot on the Expos’ starting roster during the 1999. During his first full season, Barrett had fifty-nine starts as a catcher, sixty-two as a third-baseman, and six as shortstop. He also led all National League rookies with thirty-two doubles, while ranking as one of top statistical tiers in runs, hits, and run batted in among all other rookies. Barrett struggled to perform consistently in the 2000 season. He committed fifteen errors during the course of the season, while earning .891 fielding percentage as a catcher. In addition, he hit for only a .214 batting average, with only a .288 slugging percentage. These difficulties combined to prompt the Expos to send him to the minors again. After playing thirty games with the Ottawa Lynx of the International League, Barrett returned to the major leagues before 2001. He was named onto the team's opening day lineup, and eventually earned a full-time spot on the team. He was one the Expos' most consistent hitters, and posted career high statistics that season; leading all National League catchers with thirty-three doubles. Barrett also managed to improve his defensive performance by raising his fielding percentage to .993, while only committing seven errors. He also saw success during the 2002 season. Barrett started the season by hitting home runs in the first two games of the season. He would go on to have one of his best months in the Majors, scoring with four home runs, seventeen RBI, eight doubles, and scored ten runs. The League recognized his efforts, and named Barrett the "National League co-Player of the Week" for the second week of April after he recorded a franchise record eleven RBI within two games. Barrett finished the season with mixed results. While increasing his number of stolen bases and batting and slugging percentage, he failed to record as many runs, hits, and RBI, as he did in the previous season. He committed nine errors, which resulted in a lower fielding percentage, but excelled in throwing out base runners. Barrett missed almost half of the 2003 on account of three injuries. He suffered the first during a game against the Colorado Rockies, during which one of Steve Reed's pitches accidentally hit and bruised Barrett's index finger. Barrett was able to continue playing, but claimed the injury had hindered his playing performance. He eventually managed to overcome the injury in July. He recorded a batting average of .333 and fifteen RBI. During this period, Barrett began to complain about tightness in his right hip flexor. This ailment took its toll on Barrett during a game against the Atlanta Braves, when he strained the muscles while taking a checked swing. The Expos sent Barrett on a rehabilitation assignment to play with the Edmonton Trappers, a AAA team from the Pacific Coast League. He only managed to play two games with team before fracturing his index finger on August 9. Barrett returned to the major leagues on September 12, although the Expos were already out of playoff contention. Barrett's long tenure with the Expos ended in December 2003. The team traded Barrett to the Oakland Athletics in exchange for Minor League pitcher Brett Price. The Athletics then traded Barrett to the Chicago Cubs for Damian Miller, only days after the initial transaction. Barrett, who had just spent six days with three teams, shortly signed a one-year contract with the Cubs, which was worth nearly $1,550,000. He first practiced with Cubs during their annual spring training sessions, and reported receiving a cold reception from teammates. Barrett went on to become one of their top hitters during the 2004 season. He played a crucial role in their wild card chase; Barrett maintained a .287 batting average and hit sixteen home runs and sixty-five RBI during the 2004 season. He finished the season as one the league's top defensive catchers (fielding at .994 with six errors), and led the Cubs in triples and sacrifice flies. 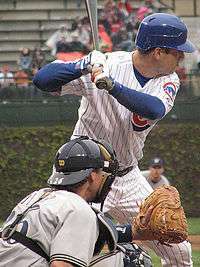 Barrett continued to be one of the Cubs’ most consistent hitters in the 2005 season. He batted over .300 in three months of the season, and finished with 16 home runs, 32 doubles, and 61 RBI. Although he failed to meet and surpass the same statistical figures in the previous season, Barrett received a Silver Slugger Award for his efforts. Additionally, Barrett was selected to represent the United States in the 2006 World Baseball Classic. He played in four games, and recorded one run batted in. Barrett sought to improve his numbers in the 2006 season, but ran into several obstacles. During the team's annual series against the Chicago White Sox at U.S. Cellular Field, Barrett was involved in a major altercation with A. J. Pierzynski, which eventually led to a bench-clearing brawl. He received a ten-game suspension, which he served near the middle of June. Barrett rebounded after the incident, and batted over .300 in the final four months of the season. He suffered an intrascrotal hematoma in early September, and was forced to miss the rest of the season. The injury and suspension caused Barrett to miss a significant portion of the season. In his shortened season, Barrett hit sixteen home runs, which matched his previous career high, and nearly surpassed his hit total from 2005. Barrett was unable to live up to expectations in the 2007 season. He was unable to replicate his statistical figures from the previous season, and finished May with a .244 batting average and only seven home runs. Barrett infamously made headlines when he was involved in a nationally televised dugout altercation with pitcher Carlos Zambrano. Lou Piniella dismissed both players for the afternoon, while the League proceeded to fine both players. Nearly two weeks later, a television camera caught Barrett engaging in a heated argument with Rich Hill over a pitch that resulted in an RBI. The tensions caused Barrett to lose his role as the Cubs' everyday starting catcher. While Barrett increased his batting average over the next few games, his career with the Cubs began to come to a close near the middle of June. Barrett breaks his bat while swinging at a pitch during his brief stint with San Diego. Various news sources reported that the Cubs had traded Barrett to the San Diego Padres on the morning of June 20. The Cubs officially confirmed these details in the afternoon, and revealed that Barrett was traded in exchange for Rob Bowen and Kyler Burke. Despite stating he had no knowledge of the trade until hearing rumors in the morning, Barrett expressed his appreciation and well wishes to the Cubs organization on his homepage. He received a one-game suspension on July 22, after arguing with an umpire over a third strike. Barrett sustained a concussion on August 5, after a base-running accident against the San Francisco Giants. The Padres placed Barrett on the fifteen-day disabled list. After returning from the injury, Barrett's performance declined. His batting average dropped from .266 to .244, while he produced near career low statistics. Barrett became a free agent after the end of the season, but was offered arbitration from the Padres. The Tampa Bay Rays expressed interest in signing Barrett, even though the signing would involve trading the Padres a future second round draft pick as compensation. Barrett accepted the Padres' arbitration offer on December 7. The Padres placed Barrett on the disabled list on April 8, 2008, after he sustained an elbow injury. The team later activated him on May 25, after he had recovered, and completed a minor league rehabilitation assignment. On July 2, 2008, Barrett was rushed to the hospital after fouling a pitch off his face. He required surgery to repair the damage, and had been placed on the disabled list for the second time in 2008. The Padres waived Barrett on October 11, after he previously expressed interest in testing the free-agent market. On December 29, 2008, Barrett signed a Minor League deal with the Toronto Blue Jays, and attended spring training as a non-roster invitee. He earned the back-up catcher role for the Toronto Blue Jays during spring training. 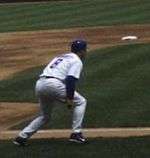 He was scheduled to back up Rod Barajas, but Barrett tore a muscle in his right shoulder while attempting to retrieve a wild pitch on April 17, 2009. Barrett was placed on the 15-day disabled list on April 18, and was expected to return within the two weeks. Prior to the injury, Barrett had made seven appearances with a .167 batting average. The Blue Jays activated Barrett from the disabled list on July 6, 2009, and designated to Triple-A for a rehab assignment, where he sustained a season-ending injury. The Jays never recalled Barrett to their roster after the designation, and released him in the following offseason. He only played seven Major League games in 2009, in which he recorded a .167 batting average, three hits, and one home run. Barrett signed a minor league deal with the Mets on June 29, 2010, and was assigned to the Class-A St. Lucie Mets. In early August, he was reassigned to play for their Class AAA affiliate, the Buffalo Bisons. On November 6, 2010, Barrett elected and was granted free agency. He has not played professional baseball since. While playing for the Chicago Cubs, Barrett was involved in two incidents with Houston Astros pitcher Roy Oswalt during the 2004 season. On August 22, 2004, Oswalt struck Barrett. Barrett, believing the pitch was a reaction to a three-run home run that Aramis Ramírez had previously hit, confronted Oswalt, and prompted both teams to take the field. Oswalt was ejected from the game, as the Astros went on to lose 11-6. Five days later, during another Cubs-Astros game, Barrett mouthed off to Oswalt and attempted to confront him. The game's umpires restrained the two before a fight could break out, but not before both benches cleared out. Oswalt remained in the game, and defeated the Cubs 15-7. In a post-game press conference, Barrett condemned Oswalt's actions, and stated, "We're going to see him again." On May 20, 2006, Barrett was involved in an infamous altercation with A. J. Pierzynski, during the Chicago Crosstown Classic between the Chicago White Sox and Cubs. During the game's second inning, Brian Anderson hit a sacrifice fly, which allowed Pierzynski to score the game's first run. Pierzynski collided with Barrett en route to home plate, causing Barrett to fall down. Pierzynski showed his enthusiasm by slapping home plate. As Pierzynski got up, he bumped into Barrett, who proceeded to punch him. Scott Podsednik came to Pierzynski's aid and subdued Barrett. Anderson and John Mabry eventually joined the brawl before both teams emptied their dugouts and stormed the field. The game's umpires ejected Barrett, Pierzynski, Anderson, and Mabry. Barrett later received a ten-game suspension, while Pierzynski was fined. Additionally, Anderson and the Sox's third base coach were also suspended for a fewer number of games. The Cubs went on to lose the game by a score of seven to nothing. On June 30, the two met during batting practice, and made amends. The following season, Barrett made headlines again when he got into a fight with teammate Carlos Zambrano. During a game against the Atlanta Braves on June 1, 2007, tensions began to rise between the two players when the Cubs allowed the Braves to score five runs in the fifth inning. The Braves recorded 20 hits, en route to winning 8-5. However, their productivity became overshadowed by the scuffle between Zambrano and Barrett. As the two returned to the dugout, they had an exchange of words, which escalated into a small fight. After Lou Piniella dismissed the two from the game, another fight ensued within the Cubs’ clubhouse, and Zambrano punched Barrett's lip. The wound required Barrett to go to the hospital immediately and receive stitches. Zambrano remorsefully admitted he was at fault after the ordeal, and Barrett later stated they had resolved their differences. Both players received fines for undisclosed amounts of money. On December 20, 2013, the Washington Nationals, named Michael Barrett, the manager of the Gulf Coast Nationals. Barrett is married to Stephanie and they have two children, Grace and Andrew (born November 2007). His cousin, Scott Fletcher, also played for the Cubs, along with many other teams over his fifteen-year career. Barrett has spent a considerable portion of his personal life devoted to helping children. He runs several youth baseball programs, including one in Hawaii, which was inspired from his tenure with the Hawaiian Winter Baseball League. He also works with the Make-A-Wish Foundation and the Cubs Care Program to help lesser fortunate and sick children. More recently, he has worked with Kerry Wood and Ryan Dempster to raise money to help Derrek Lee's daughter and research for Leber's congenital amaurosis. Michael Barrett donated $50,000 to Project 3000 and pledged an additional sum of money for every home run he hits. Barrett was also a regular guest on FOX Chicago's The Final Word television show, which is co hosted by Tom Waddle, a former Chicago Bears wide receiver. 1 2 3 4 5 Baseball Almanac, Michael Barrett Baseball Stats, baseball-almanac.com, Retrieved on June 4, 2007. 1 2 3 4 5 6 7 The Baseball Cube, Michael Barrett Baseball Statistics, Retrieved on June 20, 2007. 1 2 3 4 5 6 7 8 9 10 11 12 13 14 15 16 17 The Official Site of The Chicago Cubs, Biography and Career Highlights: Michael Barrett, mlb.com, Retrieved on June 4, 2007. ↑ Associated Press, Cubs, Padres Swap Barrett, 2 Players (June 21, 2007), Chattanooga Times Free Press, Retrieved on June 22, 2007. ↑ "Padres C Barrett clears waivers". National Post. 2008-10-11. Retrieved 2008-10-11. 1 2 Bastian, Jordan (2010-02-11). "Jays facing questions regarding staff". MLB.com. Retrieved 2010-02-16. ↑ "Michael Barrett Brings MLB Experience To UNG Baseball Staff". UNG Athletics. 2013-08-20. Retrieved 2013-08-20. ↑ "Barrett passes on Clemson, signs with Expos", The Atlanta Journal-Constitution, June 10, 1995. Accessed November 9, 2007. "For most folks, the entire experience might be overwhelming, but when former Pace Academy shortstop Michael Barrett signed a professional contract Friday with the Montreal Expos, it seemed to his family like little more than the ordinary course of business." ↑ Fitt, Aaron, Top Ten Prospects: Washington Nationals (January 4, 2005), Baseball America, Retrieved on June 20, 2007. 1 2 3 4 5 Baseball-Reference.com, Michael Barrett Statistics, Retrieved on June 4, 2007. ↑ Baseball-Reference.com, 2001 Montreal Expos Statistics and Roster, Retrieved on June 23, 2007. ↑ Baseball-Reference.com, 2002 Montreal Expos Statistics and Roster, Retrieved on June 27, 2007. ↑ Kiley, Mike, Cubs finally catch up with Barrett (December 17, 2003), Chicago Sun-Times, Retrieved on June 27, 2007. 1 2 Ladson, Bill, Notes: Results may vary (June 1, 2003), mlb.com, Retrieved on June 25, 2007. 1 2 3 Ladson, Bill, Notes: Barrett heads to DL (July 23, 2003) mlb.com, Retrieved on June 25, 2007. 1 2 CBC Sports, Barrett back behind plate for Expos (September 10, 2003), cbc.ca, Retrieved on July 15, 2007. ↑ Baseball-Reference.com, 2003 Montreal Expos Statistics and Roster, Retrieved on July 15, 2007. ↑ Shea, John, A's add catcher Barrett, for now (December 16, 2003), San Francisco Chronicle, Retrieved on August 9, 2007. ↑ Armour, Nancy, Cubs reach deal with Barrett, trade Miller to Oakland (December 21, 2003), USA Today, Retrieved on August 9, 2007. ↑ Associated Press, Barrett accepts one-year deal, (December 21, 2003), espn.com, Retrieved on June 6, 2007. 1 2 3 De Luca, Chris, Catching flak: Barrett timeline (June 21, 2007), Chicago Sun-Times, Retrieved on August 9, 2007. ↑ Baseball-Reference.com, 2004 Chicago Cubs Statistics and Roster, Retrieved on June 23, 2007. 1 2 3 4 5 6 Yahoo! Sports, Michael Barrett – San Diego Padres – Game Log, Retrieved on August 9, 2007. ↑ Baseball-Reference.com, 2005 Chicago Cubs Statistics and Roster, Retrieved on August 12, 2007. ↑ WorldBaseballClassic.com, ’06 World Baseball Classics Statistics, Retrieved on August 12, 2007. 1 2 3 Associated Press, Zambrano, Cubs' Barrett suspended 10 games for punch, (May 26, 2006), msnbc.com, Retrieved on June 2, 2007. ↑ Muskat, Carrie, Barrett on DL after surgery September 3, 2007, mlb.com, Retrieved on June 5, 2007. 1 2 3 4 5 6 Associated Press, Zambrano, Barrett brawl in dugout during Cubs' loss, (June 1, 2007), espn.com, Retrieved on June 2, 2007. ↑ Associated Press, Cubs catcher has another face-to-face with starter (June 13, 2007), espn.com. Retrieved on August 14, 2007. ↑ Associated Press, Piniella still confident in Barrett, says he needs time off (June 14, 2007), espn.com. Retrieved on June 20, 2007. ↑ Associated Press, Sources: Cubs dump Barrett via trade to Padres (June 20, 2007), espn.com, Retrieved on June 20, 2007. ↑ Rosenthal, Ken, Cubs trade Barrett to Padres (June 20, 2007), FOX Sports, Retrieved on June 20, 2007. ↑ Muskat, Carrie, Cubs deal Barrett to Padres (June 20, 2007), mlb.com, Retrieved on June 20, 2007. ↑ Miles, Bruce, Cubs ship Barrett to Padres (June 21, 2007) Retrieved on June 21, 2007. ↑ McPherrin, Corey, Fox News at Nine (June 20, 2007) [TV], WFLD Fox Chicago 32. ↑ Associated Press, Padres catcher Michael Barrett drops appeal, serves 1-game suspension Friday (July 27, 2007), Yahoo! Sports, Retrieved on July 28, 2007. 1 2 Associated Press, Padres place Barrett on DL, option Cassel (August 11, 2007), Yahoo! Sports, Retrieved on August 11, 2007. 1 2 Brock, Corey, Barrett accepts arbitration with Padres (December 8, 2007), mlb.com, Retrieved on December 8, 2007. ↑ Lancaster, Marc, Rays Lay Groundwork For Deals (December 7, 2007), The Tampa Tribune, Retrieved on December 8, 2007. 1 2 PA SportsTicker, Padres activate C Barrett from DL (May 25, 2008), National Post. Retrieved on June 2, 2008. ↑ Barrett leaves game after fouling pitch off face (July 2, 2008), Yahoo! Sports. Retrieved on July 2, 2008. ↑ Wilson, Bernie. Barrett hopes to have facial surgery soon (July 7, 2008). USA Today. Retrieved on July 12, 2008. ↑ "Padres waive Barrett, who elects free agency". Herald Tribune. 2008-10-11. Retrieved 2008-10-11. ↑ Frisaro, Joe (2008-12-29). "Barrett invited to Jays camp". MLB.com. Retrieved 2008-12-30. ↑ "Blue Jays name Scott Richmond fifth starter, Barrett backup catcher". Canadian Press. 2009-04-01. Retrieved 2009-04-01. 1 2 3 Campbell, Morgan (2009-04-18). "Barrett benched with torn muscle". The Toronto Star. Retrieved 2009-04-18. ↑ Bastian, Jordan (2009-07-06). "Rookie lefty Rzepczynski called up". MLB.com. Retrieved 2009-07-07. ↑ Rubin, Adam (2010-06-29). "Mets sign Barrett to minor league deal". ESPN. Retrieved 2010-06-30. ↑ "Bisons roll to seventh straight win". BuffaloNews.com. 12 August 2010. Retrieved 15 August 2010. ↑ "Barrett granted free agency". retrosheet.org. 2010-11-06. Retrieved 2011-08-16. ↑ Kiley, Mike, Grin and Barrett? Cooling heels not easy (August 31, 2004), Chicago Sun-Times, Retrieved on June 8, 2007. 1 2 3 Associated Press, Teams touchy after incident Sunday, (August 27, 2004), espn.com, Retrieved on June 2, 2007. ↑ Carpenter, Dave, Houston 15, Chi Cubs 7 (August 27, 2004), Yahoo! Sports. Retrieved on August 14, 2007. 1 2 ESPN.com, Cubs vs. White Sox Box Score (May 20, 2006), Retrieved on August 8, 2007. 1 2 3 4 5 Associated Press, Cubs' Barrett slugs Pierzynski, leads to melee, (May 20, 2006), espn.com, Retrieved on June 2, 2007. ↑ Associated Press, White Sox Take Game 1 at Wrigley Field, (June 30, 2006), Comcast Sports Center, Retrieved on June 2, 2007. ↑ Seligman, Andrew, Atlanta 8, Chi Cubs 5 (June 1, 2007), Yahoo! Sports. Retrieved on August 14, 2007. 1 2 Associated Press, Zambrano takes blame for fight, (June 2, 2007), Yahoo! Sports, Retrieved on June 2, 2007. ↑ Associated Press, Zambrano, Barrett put dugout scuffle behind them, (June 2, 2007), espn.com, Retrieved on June 2, 2007. 1 2 Barrett Baseball, Michael Barrett – Official Site, barrettbaseball.com, Retrieved on June 5, 2007. ↑ Muskat, Carrie, Righty to give proceeds from bowling tourney to Project 3000 (May 29, 2007), mlb.com, Retrieved on June 5, 2007. ↑ Fox Chicago, Cubs Catcher Michael Barrett on The Final Word:, myfoxchicago.com, (June 3, 2007), Retrieved on June 5, 2007.